Mama elephant gives baby a bath, and water and blooms spray all over in this adorable design. All pink with the little grey elephants, a casual, hand-drawn script letter style, and more flowers sprinkled here and there on the design makes this an adorable style for any event or party. 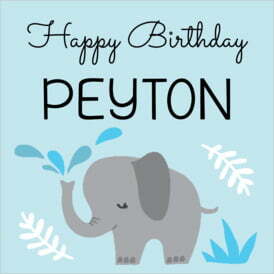 Customize your Baby Elephant labels today! Printed on your choice of coated paper or waterproof vinyl label stock, Evermine labels are peel-and-stick and come on sheets measuring 9" x 12". Depending on the size of the labels, there are between 6 and 60 labels on each sheet. All Evermine label stocks print with fine detail and rich color. They are writeable with a sharpie or marker. The vinyl labels will do just fine immersed in an ice bath or a refrigerator. The vinyl labels are also easy to reposition or remove from smooth surfaces such as glass, metal and plastic. Make all your special events and products memorable with Evermine personalized Baby Elephant style labels. These labels are not guaranteed to withstand a trip through the dishwasher, or prolonged use around creams, oils or acids such as citrus oil, vinegar, fragrances, etc. This shape is very versatile as it is small enough to fit on many containers and has plenty of room for words. It fits perfectly on square 2" favor boxes, also works well for the side of canning jars, and for medium favors and small gifts. The illustration below is not at actual size, but it shows you how this item compares in size to a credit card.